James Jones was the best shooter in the house Saturday night. LOS ANGELES -- Miami Heat forward James Jones came to All-Star Weekend focused on negotiating a new labor agreement in his role as secretary-treasurer of the players' union. He got far more work done with his 3-point stroke. Jones capped his two-year journey from wrist surgery that left his career in jeopardy to 3-point shootout champion Saturday when he held off Ray Allen and Paul Pierce to become the third Heat player to win the title in five years. Jones got 15 points in the first round to advance, then scored 20 in the finals to hold off the two stars from the rival Boston Celtics. Jones is the fourth Heat player to win the 3-point competition and extends an odd-year trend that has seen Jason Kapono win it in Las Vegas in 2007 and Daequan Cook take the title in Phoenix in 2009. It was an emotional victory for Jones, who defeated one of his idols in Allen and also won the shootout in front of another mentor in Reggie Miller, who worked as the television analyst for the competition. But Saturday's performance was especially meaningful for Jones because it validates his place among the league's top 3-point shooters after his surgery setback just months after he signed a free-agent deal with his hometown Heat in 2008. Despite having one of his best seasons from beyond the arc, Jones entered Saturday night as a significant underdog in a field that also included Golden State swingman Dorell Wright, Oklahoma City forward Kevin Durant and Cleveland guard Daniel Gibson. Pierce was the defending 3-point champion, while Allen recently passed Miller to become the league's career leader in made 3-pointers. 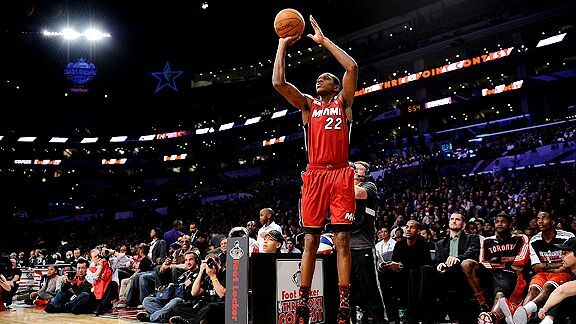 Durant leads the league in scoring and Wright's 135 made 3-pointers are the most among all players this season. But Jones, who is shooting 42.3 percent from 3-point range this season, is accustomed to doing his best work while in the shadow of higher-profile players. He has made a team-high 93 treys as a member of the Heat's supporting cast that surrounds LeBron James, Dwyane Wade and Chris Bosh. Pierce opened the final round with 18 points before Jones scored 20 while making four of the five “money balls” that are each worth two points. Allen, who had a 20-point round in the opening set, then had a chance to top Jones but finished with only 15 points in the final round.